When I think of Pall Mall, I think of cigarettes, which for me, as a non-smoker, is not the greatest association. 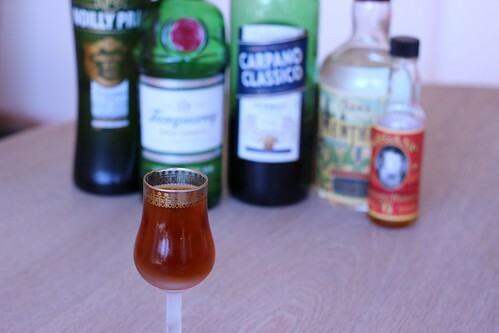 This is another recipe that I get to use my crème de menthe in though, so that definitely piqued my interest. It’s interesting to see where a hint of mint can really add to a drink in unexpected ways (to me). This is kind of like a vermouth-heavy Perfect/Medium Martini with a little twist, which is a good start. The crème de menthe is actually quite nice with this. I wasn’t so sure going in, but it is actually a nice drink. The mint gives it an extra dimension that is refreshing and there is still enough balance so that this isn’t overly sweet. I could see playing with this again in the future.